Finding motivation to exercise can often be harder than the actual workout. Seniors in Mesa mobile homes at Palm Gardens have access to a gym and a pool, but using the amenities to improve physical strength and endurance is a challenge in and of itself. Staying fit as a senior is crucial, not just for physical health but also for mental agility. 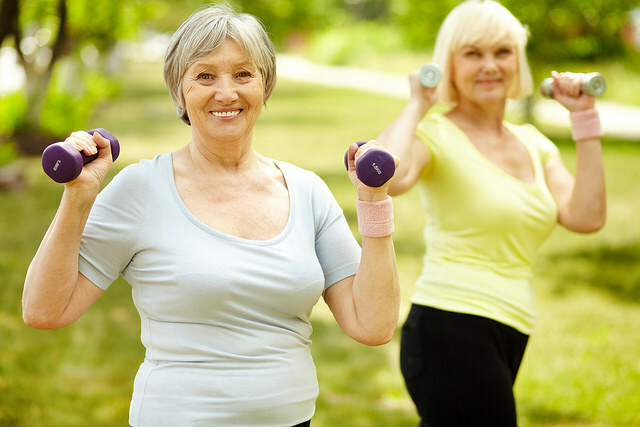 Here are some easy workout tips and the benefits they can provide for seniors living in the Mesa RV parks. The most important part of any workout is stretching your muscles to warm them up. Hamstring stretches like bending forward to touch your toes engage multiple muscles that can be vulnerable if not warmed up properly. Make sure you take plenty of time to warm up whatever body parts you are going to be focusing on in that workout before you begin. Low impact cardio is crucial for keeping your heart healthy and for boosting your metabolism. Get your heart rate up by cycling, jogging, or even power-walking around the Mesa RV parks. A cheap indoor option for air conditioned exercise is to power walk a nearby shopping mall. As long as you get in 15 minutes of gentle cardio a day, you will be reducing your risk of high blood pressure, high cholesterol, and diabetes, all while improving the health of your heart. Cardiovascular exercise also increases your breathing rate, which in turn improves lung health. Keep your muscles’ strength up! A few reps of leg presses or bicep curls with dumbbell weights can make all the difference when it comes to protecting your joints. Remember, the strength in your muscles helps take the pressure off weak joints and bones, so any improvement in muscles strength can be an improvement in pain management of weaker spots. A strong core is essential to good physical health because so much relies upon it. Poor posture, balance, and stability can all be improved by strengthening your core. Abdominal crunches, modified pushups, and yoga are all great exercises to help you improve core strength. Not only does regular physical exercise help improve your physical health, it can also help improve your mood, lower stress levels, and boost your cognitive abilities like problem solving and multi-tasking. Check out our blog for more information about the Mesa mobile homes. Contact us if you have questions regarding Mesa RV parks.